Volunteer State Community College in Gallatin is home to one of six nationally accredited diagnostic medical sonography program in Tennessee. Others include Vanderbilt University, South College in Knoxville and Chattanooga State Community College. Typical of most programs in the state, the competitive program at Vol State is always full. Graduates earn an advanced 16-month technical certificate with most qualifying for an associate degree in health sciences. 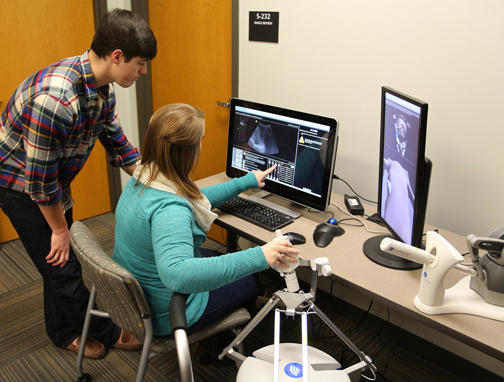 Connor Hansford of Goodlettsville watches as Denee Kelley of Murfreesboro simulates a scan of the liver using new equipment at Vol State. Edward Carlton, director of the diagnostic medical sonography program at Vol State, explains why the career is in demand. “One of the chief reasons is the technological advancements in the field,” Carlton says. “We are able to produce ultrasound machines that can process and obtain much more information than ever before. As a result, we can image anatomical structures and perform procedures we couldn’t just a few years ago. “I compare the technological improvements in ultrasound machines to the technological improvements to cell phones,” Carlton continues. “Every 4-5 years there are huge leaps in what cell phones are capable to doing, and ultrasound machines are similar. “A 10-year old phone cannot do video chats, take photographs or surf the web as quickly, efficiently, and accurately as a 1-year old phone. A 10-year old ultrasound machine cannot process information and take sonograms as efficiently as newer machines. At the end of Vol State’s 16-month program, graduates qualify to sit for national board exams to become registered diagnostic medical sonographers. Carlton says 100 percent of last year’s graduating class earned this credential before they graduated and 100 percent were employed seven weeks after graduation. Median salaries for sonographers in Nashville, Knoxville, Chattanooga and Memphis all fall between $65,000 to $68,000 a year.